U.S. Attorney Loretta Lynch will not complete the Justice Department’s investigation into the choke hold death of Eric Garner before she leaves office, according to a report released Friday. The federal civil rights probe was launched months after Garner’s July 2014 death on Staten Island in New York City, when he was placed in a choke hold and said, “I can’t breathe” 11 times before he died. 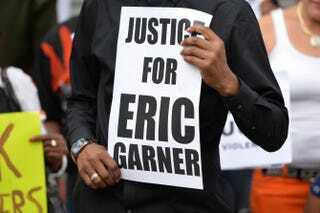 The New York medical examiner ruled Garner’s death a homicide. The New York Daily News reports that the Department of Justice will neither charge nor clear the police officers involved in the case within the next week, and the case will likely be decided by Sen. Jeff Sessions (R-Ala.), President-elect Donald Trump’s choice for attorney general, who is now undergoing highly contested confirmation hearings. Sessions, a former state attorney general, is considered more pro-police than President Barack Obama’s DOJ picks. His words, in fact, confirm this. NYPD officer Daniel Pantaleo, who was captured on video holding Garner in a choke hold, was not charged when a Staten Island grand jury declined to indict him. After that, many, including Garner’s children, called for federal indictments against Pantaleo and the other officers involved. Erica Garner, one of the most outspoken of Garner’s children, addressed the case on Twitter on Friday. “No matter AG Sessions or AG Lynch white supremacy will be vigorously defended regardless of findings of systemic abuses. #factsonly,” she wrote. U.S. Attorney General Loretta Lynch, whose DOJ came to conclusive resolutions regarding police conduct in the cities of Baltimore and Chicago, took over the probe from Brooklyn, N.Y., federal prosecutors and the FBI at the end of October 2016. Some believe that shakeup left investigators with little time to complete a review and convene a grand jury.